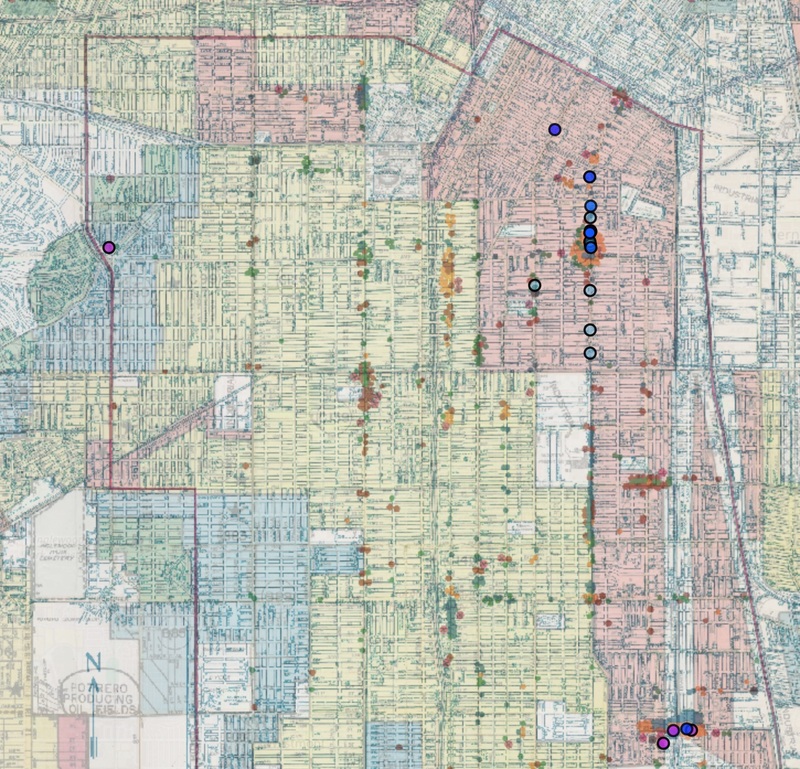 The image above is taken from my in-progress digital project, “Mapping Improvisation in South Los Angeles.” Using the Neatline plug-in for Omeka, I have georectified and layered two historic maps of Los Angeles: a map produced in 1939 by the Home Owners’ Loan Corporation (HOLC), and a curfew map of Watts that was produced in conjunction with the McCone Commission. The Home Owners’ Loan Corporation map was intended as a guide for home lenders that rated neighborhoods based on the stability of investments. The maps produced by the HOLC ultimately enforced the segregation of ethnic minority communities by designating them as “high risk” using the color red. This practice is the origin of the term “redlining” to indicate the economic discrimination on the basis of race and ethnicity. The Watts curfew map accompanied the report produced by the McCone Commission, which sought to analyze the underlying cause of the 1965 Watts uprising. The map contains a border indicating the boundaries of the curfew area, and color-coded circles indicate various forms of damage which were incurred over the course of five days (i.e. green, blue, pink, and orange dots indicate the damage, arson, looting, and destruction of private buildings or businesses). Overlaid on these maps are points indicating the locations of historic jazz venues (in blue) and the locations of creative workshops that utilized improvisation established after the uprising (purple). As more points are added to the map, I will analyze how networks of improvisation within Watts can be read as forming in response to the systemic exclusion which led to the uprising and its aftermath.